Tomorrow, we make history. In the aftermath of the new political administration, women across the nation (and globally) will be marching to demand social justice in every form. The Women’s March on Washington is expected to be one of the largest political demonstrations in history, with 200,000 people already expected to attend in D.C. alone. But that does’t include the hundreds of Sister Marches happening across the nation and the world. If you visit the official site for the Women’s March on Washington right now, there are an estimated 673 sister marches happening tomorrow, and 2,226,540 sister marchers hitting the streets. Women’s March Los Angeles is one of these sister marches — and there is an expected turnout of 70,000 people. We were able to speak with Aly Nagel and Candace Reels, the social media managers of Women’s March LA, about their important roles in tomorrow’s historic march from Pershing Square to City Hall in Downtown Los Angeles. Aly quit her day job in order to take on a larger role organizing the march, and Candace brings her expertise as the founder of Female Collective. They told HelloGiggles their reasons for marching, and shared knowledge that will motivate any woman who is nervous about the march, feels hopeless about the future, or needs help getting the men in her life involved with feminist justice. 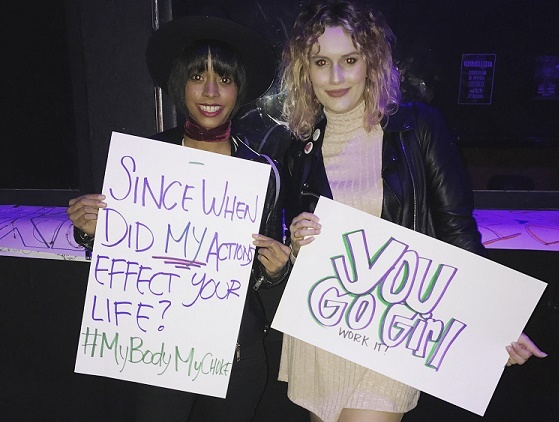 HelloGiggles: What are your roles in the march? Aly Nagel: I am working alongside Candace managing the @womensmarchla and @womensmarch_ca accounts on Instagram. We are Social Media Managers for those two branches of the march. We have also been working with the PR and outreach team to get additional partners on board. Candace Reels: We’re two of the women getting millennials involved and active on social media for the march. HG: Aly, what pushed you to quit your day job in order to take on this role with the Women’s March? AN: Around the end of November, I was becoming extremely vocal about my Women’s Rights advocacy on [social media]. Although I loved my job and the people I worked with, my true passion is empowering women. As I was posting and talking about it more and more on social media, I was contacted by a colleague and asked if I was interested in becoming an organizer for the march. She then put me in touch with Gabriella Davi-Khorasanee, who is one of the Representatives of the March from California (which encompasses around 14 different Sister Marches taking place across the state). I was working mainly with Bay Area organizers, and after a week or two, Gabriella put me in contact with Tracy Samson of Women’s March LA. We hit it off, and Tracy connected me with the LA team. I went to a meeting (bringing Candace, who I’d done other work with), and then they gave me the role of working with social media because of my background. HG: Candace, how did you get involved? CR: Aly was so kind enough to bring me on board the team. A huge thank you to that wonderful woman! I have a female empowerment clothing brand and online community called Female Collective, whose audience includes millennials that want to be involved, speak out, and have their voices be heard. Aly knew that I would be a great asset to the team for social media purposes. HG: Why do you march? AN: I march because I want to give a voice to women who do not have the strength, confidence, or ability to speak up for themselves — whether they are victims of sexual assault, cat calling or street harassment, ashamed about having an abortion, oppressed in the work place or home, etc. My job is to help them feel heard. Women should have COMPLETE and TOTAL agency over their bodies, and never feel like they don’t have control over what happens to them as human beings. My privilege and purpose is to help women feel confident and safe in their own skin — and most importantly, empowered. CR: I march because I believe the rise of the woman = the rise of the nation. We are powerful beings that can achieve anything we set our minds to. Together we can conquer the world and do amazing things. It’s been proven already, but on January 21st, the world will see what us women can do. This is only the beginning. HG: What advice do you have for women who may be intimidated by the size of the march or have never marched in a protest before, but want to participate? AN: The march is, first of all, not a protest. In some ways (I believe) it will be a therapeutic, cathartic release of emotion. A safe space where we can collectively come together and our voices will be heard after the tumultuous array of emotions we’ve all been experiencing for the past several months. Don’t be scared, it’s going to be fun! CR: We are all there for a powerful, good cause — so the energy will be like no other…Everyone will want to feel [it]. The people there are like-minded individuals who all share the same goal of making this world a better place. You’ll hopefully come out of it feeling inspired, uplifted, and with a whole new group of friends/your personal girl gang or Feminist Fight Club. This is moment to be a part of history, or as I say, HER-story. HG: What words do you have for women who feel hopeless and unsure of what a march can achieve? AN: The march is just the beginning! As one of my favorite fictional characters, Penny Lane, said, “It’s all happening!” I believe the march is just the tip of the iceberg for what’s about to happen. Women, men, and nonbinary people are organizing publicly and privately to make a change and keep the momentum going. CR: A march, to me, can achieve so much. You’re bringing together a bunch of strangers who all want the same thing, which is a better world for all. Whether you’re there marching for women’s rights, LGBTQ rights, immigrants, refugees, Black Lives Matters, climate change, and the list goes on — we all want a world that’s equal for all. Together, we can achieve that. A march let’s the world hear your voices, and also lets people know that we are here and not going anywhere. HG: What can women tell the men in their lives to get them to join the Women’s March? AN: Men can act as allies and are totally welcome to attend the march. If anything, men are encouraged to come! Plus, they can echo the chant “My body my choice” with “Her body her choice” — [and it] is awesome to see cis straight men standing in solidarity. CR: I found that men listen more if you make it personal to them, so tell them that they should be at the Women’s March to march for their mother, wife, girlfriend, sister, and/or daughter. I believe that a better world for women is a better world for all — and they should, too. HG: How are the Women’s Marches across the country communicating with each other? AN: In tons of different ways! First of all, social media has been an amazing tool in all of this. It’s how Candace and I were able to connect with Breanne Butler of the national march and get together to ask people #WhyIMarch last month in Santa Monica. We also communicate with other marchers on weekly calls with different branches. It varies depending on your role and location, especially since we are all volunteers! CR: Breanne Butler, who is part of the Women’s March on Washington team, is the liaison between all the marches across the country. We also communicate a lot through social media (mainly Facebook and Instagram ) and also through email. We were all a bunch of strangers who have now formed a sisterhood of amazing women who are organizing these marches. Get more information about Women’s March LA here, or find a sister march near you. Here are some important things you should do to prepare for the march, and here are some ways to make sure your voice is heard even if you are unable to attend.